The oldest person in Britain has spent the day celebrating her 112th birthday. Charlotte Marion Hughes, from Marske in Cleveland, was born on August 1, 1877 - the same day that Alexander Bell founded his first telephone company. In that same year the first lawn tennis championships were held at Wimbledon and Queen Victoria was still Empress of India. Mrs Hughes, a former teacher, puts her longevity down to "a good honest life" and adherence to the 10 Commandments. She takes a keen interest in politics. During her lifetime there have been 21 different prime ministers at Downing Street, including Disraeli and Gladstone. On her 108th birthday she was invited for afternoon tea with Margaret Thatcher - even though she is a staunch Labour supporter. She said: "I told her I was Labour when she cuddled up to me in Downing Street. I said 'Don't cuddle me I'm Labour.' She said, 'Never mind, come and let us have a cup of tea." Two years ago Mrs Hughes, who still lives in her own home, celebrated her 110th birthday by flying across the Atlantic in Concorde - making her the oldest person to fly during the history of aviation. Mrs Hughes married her husband Noel, a retired army captain, at the age of 63 after she retired. The couple lived happily for 40 years until Mr Hughes died at the age of 103. Charlotte Hughes died on 17 March 1993 at the age of 115 at St David's Nursing home in Redcar, Cleveland. She lived in her own home until 1991 when she began having trouble walking. She kept her mental faculties until the very end. 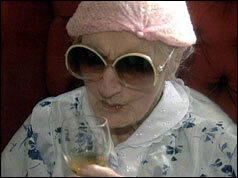 At the time of her death she was not only the oldest person in Britain, but the second oldest person in the world. The oldest woman of all time, according to the Guinness Book of World Records, was a French woman, Jeanne Calment, who died on 4 August 1997, aged 122 years and 164 days.